2 Bedroom, 2 Bathroom With Amazing View To The Volcano/caldera And A Plunge Pool. The property is in a quiet neighboorhood although very close to the centre of Fira. Traditionally decorated apartments, ageing all the way back to the 18th century, have been fully refurbished in the winter of 2013 and transformed into cosy suites..
Our residence consists of two elegant suites (one ground floor and one upper floor) connected with an outside stairway. Both suites have a modern,very spacious bathroom with whirlpool bathtubs and their own private balcony with uninterrupted views of the volcano. An exterior plunge pool is also available forl the guests of the Serenity Villa. There is a washing machine in the upper floor suite. Please leave your laundry in the provided bags (separated, if needed) and our housekeeper will run the washing machine, when there is a full load. Public parking area accessible , only 5 minutes from the property. Parking #8. Private Plunge Pool available for the guests of our villa only. Price includes every day cleaning services (except Sunday). 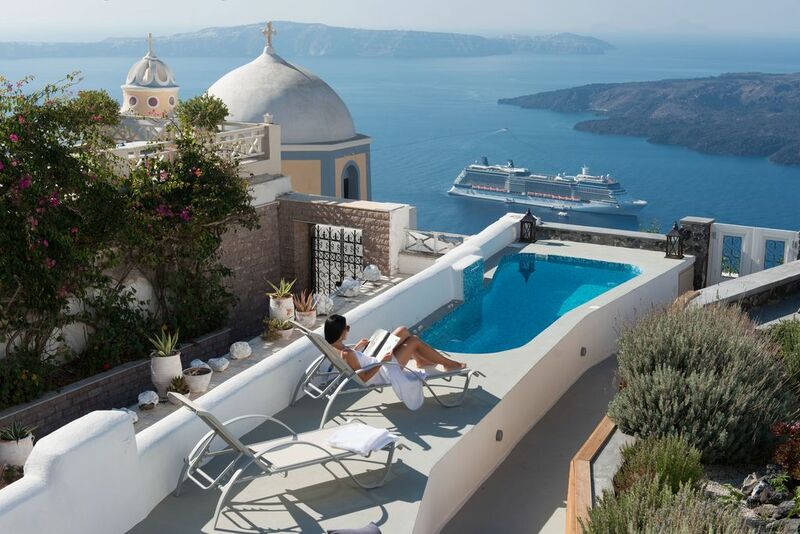 Spend a day exploring the island, visiting the Archaeological sites of Thira, making a wine tour or enjoy a relaxing cruise in the infamous caldera of Santorini. The pictures of the villa did not deceive....inside & out. Be aware that your pool is very close to the next villa pool, so not much privacy if that is what you are looking for. Because the church is just outside the villa, many folks stop to take pictures and watch the sunset..BUT not as much foot traffic as if you were in Fira. There were 6 of us, so we rented upstairs & downstairs. Four of us rented both the upper and lower villas and could not have been happier. From the views to the wonderful pool to the location, everything was perfect. The booking was easy and the host is extremely responsive. Whether waking up to the view or hanging out in the evening on the outside decks, we could not have asked for anything more. Our family of five rented both of the suites at Serenity Villas just last week. We enjoyed an unforgettable stay there. The setting is stunning, the suites are gorgeous, and Mary, the hostess, is amazingly gracious, accommodating, and helpful. She helped us so much throughout our stay - gave great suggestions for what to do, scheduled transfer to the ferry, met us to help with our luggage, and made our dinner reservations. We would not have changed a thing about our stay in Santorini - our experience with Serenity Villas was outstanding from start to finish! Santorini has been on my list of places to visit for a few years now, and I finally did this year. The villa and island did not disappoint. From the moment our transfer pulled up Stamos was there to great us and took our luggage the short walk to the villa where we were greated by Stella the cleaner and a cool glass of water. The fridge was nicely stocked with some essentials. The views across the Caldera were spectacular, and you are ideally placed for a short 5 min walk to sample the many restaurants of Fira and Firostefani and the amazing sunsets. Although there was only 2 of us, we booked both suites so we could choose between the different terraces and have exclusive use of the pool. This means we had kitchen on both the ground and upper level. Not that we cooked, but we did have salads and snacks. Been in no doubt, this is a lovely place to stay which was kept clean and tidy by the lovely Stella throughout our week. Clean/ luxurious villa, amazing view and welcoming hosts! Our stay at Serenity Suites was absolutely perfect! The rooms were incredibly clean and nicely furnished. Mary, the hostess, was very welcoming and even made us ice cream when we arrived! She also provided us with wine, bread and meat and cheese for breakfast. The view was incredible and the sun sets right in front of the villa. It is also a very close walk to town, less than 10 minutes! I would highly recommend staying here to anyone. Rates include all taxes and are based on the minimum occupancy of 2 guests. For every extra person additional charges might apply.Please contact the owner for more information.